Our vacation in Texas last year was one of the most enjoyable getaway we had as a family. When you have two families having fun together is just priceless. My Burritos certainly misses Akesha a lot! We went so many places in Texas that's what made it so much memorable. I wish and hope that we could all get together soon, hopefully next year. It would be so much fun now that the kids are a lot bigger. Predictive analytics encompasses techniques for data mining to analyze and predict events based on large amounts of collected information. This information is used for statistical calculations to predict future events. This can be applied in many industries, such as marketing, insurance, healthcare, telecommunications, retail, travel, and many others. For the purposes of this article, we will discuss how predictive analytics could benefit work health and safety routines. Making predictions about potential hazards and risks could be very valuable information used to save money, time, and even lives. With our current technology, we can gather enormous amounts of data, and readily compile it into useful information. This idea commonly referred to as “Big Data,” has allowed companies to grow, reach out to individual needs and interests, and has paved the way for the way businesses interact with their customers. Using the power of predictive analytics can also be an integral part of making your business more efficient, and getting more out of your health and safety routine. Imagine an assembly line of workers constantly in motion with hazards all around them. Using large machinery, exposure to dangerous chemicals, and working in high places are just a few of the risks involved in many industries. Being able to predict when a machine might require maintenance, or higher risk areas in the workplace is very useful information to have in order to prevent accidents from occurring. If the data is showing that your workers are constantly getting sick in a particular area of the building, you can identify this area as a hazard that needs to be disinfected to prevent future occurrences. Another example could be a machine that tends to breakdown at a particular time of the day. Studying this data and using it to solve problems can make your business run more efficiently and will help the productivity of your workers. Some of the data that could be helpful to health and safety programs for injured workers may include: past safety experience, age, duration of employment, time of shift, location, ongoing maintenance history and schedules, how your health or safety program is being implemented, or even the types of regulations that apply to that working environment. All of the above-mentioned data will only be useful if it can be applied toward prevention programs and be analyzed in a quick manner. Using algorithms and computing power to do this will enable your health and safety plans to work in real time, crunching data from current situations. The ability to have this real-time data will offer practical solutions to problems that may have occurred during the previous day or week. What is key here is that the data being collected is being used in the right way. Just merely having a bunch of statistics could mean absolutely nothing unless it is being analyzed in the right manner. When using the process of predictive analytics one must first do two things, decide what type of data to collect, and how to use this data for preventative measures. This will require a sound understanding of the work environment, work flows, and current procedures put into place. Once these things are all known you can start to come up with a health and safety program that is proactive in nature, and one that will save you tons of money as time goes on. The more data that you compile over time, the more accurate your predictions will become. This will keep your employees healthy, uninjured, and productive in the workplace. Nick Quinlan is a blogger with a focus on health and safety related topics, striving to make sure employers have the latest tools for securing the safety of their workforce. One of the tools is software provided by eCompliance Management Solutions. If you wish to learn more about Nick you can visit on Google+. When we were in Ocean City, one of our favorite afternoon treat was walking along the boardwalk to eat at our favorite restaurant. On going back to the hotel, we would walk at the seashore, chase the seagulls and finish our walk watching the sunset. It was such a fun time for the whole family. I mean, who would not love watching the sunset right? In fact, when I was growing up, we live at a coastal part of the Philippines and my friends and I would watch the sunset almost everyday and we would talk about what went on with our days or talk about what we want when we grow up. Watching sunset by the sea is just uplifting. You would want to thank God for the beautiful day. For everything that happen, the sun usually witnesses what went on with our day but at the end of the day, the sun surrenders. Human should do the same, we should surrender to God whatever we have been through everyday and pray that the new day brings hope and happiness. Daddy served as the bowflex for these two Burritos. I love to see these three musketeers all smiles. It makes it worth that I am always absent in the pictures but capturing their moment is a joy in my heart. I hope that we could do this again soon. 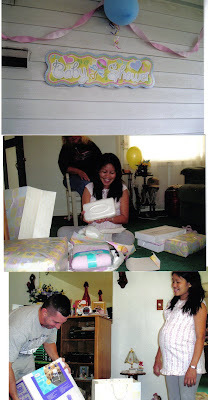 The photos below were taken during the baby shower that my in-laws organized for my first pregnancy. When you decide you are ready to conceive, it may be time to start making some lifestyle changes. You know there are a lot of things you can't do, eat, or drink once you're pregnant, but did you know you should also change your lifestyle when you're trying to conceive? Put out those cigarettes, pass on that glass of wine, and say goodbye to your cup of coffee. Your body may not always be a temple, and we all have our little indulgences, whether it's a fondness for desserts or a nightly glass of wine. But when you begin to plan for a pregnancy, it's time to start thinking about someone else's health besides yours, because what happens to your body happens to your future baby, too. According to the experts at www.pregnancytips.org , it's not only drugs, alcohol and smoking that you need to be aware of - habits like junk food and over-exercising can interfere with your ability to conceive and potentially cause harm to your baby as well. So adopt your healthy lifestyle now, well in advance of conception. Begin taking prenatal vitamins while still trying to get pregnant, and get your body in tip-top shape now. One of the many things we did in Ocean City is explore the the Jolly Roger Amusement Park. There are different kinds of enjoyable activities including mini golf, water slides, and many more. We went on this for so many times before we came back home. We even spent my daughter's birthday at Jolly Roger. It is expensive though. In every part of it, you have to pay in order to enjoy it. Our favorite would be the splash mountain and the Jungle Golf. The park rides wasn't bad as it only cost $41.18 for the two of them to get the bands they need in order to enjoy the fun rides. Swimming in the ocean is fun but they get tired of it eventually so this amusement park was a great alternative. Taking your kids on vacation with you might sound like a dream, but if you fail to plan, it could turn into a nightmare. If it is the first time that you have gone away with your family unit, you need some helpful advice. Vacationing with kids is different to going alone. There are ten times as many things to plan and worry about when you have your children with you. The key to a perfect family vacation is staying calm. The moment you lose your temper, the vacation might as well be over. Here are some cool tips that will help you have a perfect family vacation. Everyone's ideas are valid. When you are planning your vacation, you need to make sure that you listen to everybody. You never know, your kids might have some interesting ideas about what you can do on your next vacation. Sit down with your family and see what everybody wants to do. Don't ignore people's ideas. If you want your vacation to be special, you need to let everyone have their say in what you do. You will quickly realize that you all need space when you are on vacation. If there are four of you in one small hotel room, you will struggle to enjoy your vacation. The more room you have as a family, the happier you will be on vacation. Look for an apartment online. For example, if you are staying in Paris, sites, such as Housetrip, will allow you to rent an entire home, rather than just a room. You might not think you will need it, but it is worth having. You know as much as anybody else that children are clumsy by nature. If there is one thing that can ruin your time on vacation, it is one of your kids hurting themselves. Make sure that you always have a first aid kit with you so that you can sort out minor problems. If your children might get travel-sick, you should take some tablets for that too. There is nothing worse than going on vacation and wasting the entire time watching TV. You can do that at home. From the moment your break starts, you want to enjoy every second of it. That means forgetting about watching shows on TV and focusing on having fun as a family. Make a 'no TV' rule for you and your kids so that you can enjoy your break instead. Sometimes, on vacation, everybody likes to go off and do different things. Your kids might join a kids' club and spend the entire day there, and you might want to go and see the sights. You should make sure that you have some time as a family every single day. Make sure that you always eat together so that you are spending quality time with one another. It is healthy to have time apart, but you want to make some lasting memories together too. When you have a spare day together, you should make sure that you plan some activities. If you have small children, you will know how easily they can find things boring. You need to make sure that everyone is busy having fun while you are away on vacation. Before you go away, research your destination. Look for fun, family sports that you can try together. If you plan your days, you will find that you can pack more things into them. That way, everyone will get to do what they want.